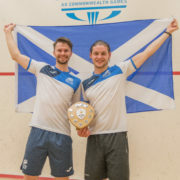 Doug Kempsell and Kevin Moran pulled off a shock win over world champions Alan Clyne and Greg Lobban to secure the Scottish Men’s Doubles Championship title at Scotstoun in Glasgow this afternoon (Sunday). 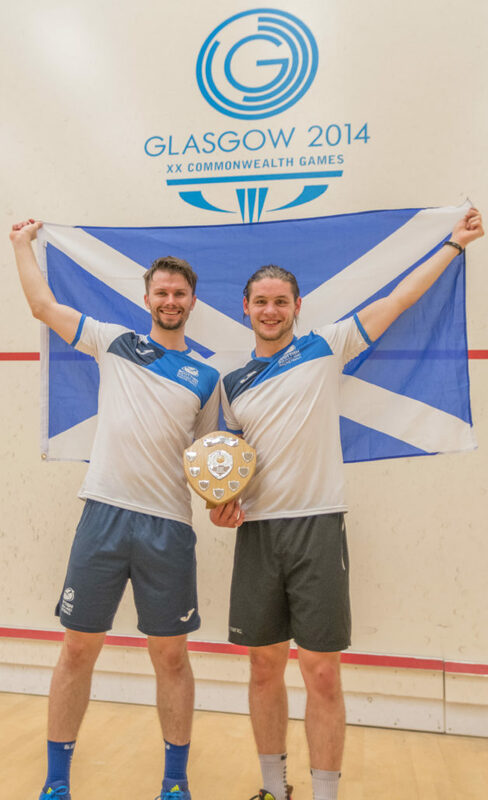 While nobody doubted the quality of Kempsell and Moran, few had expected them to emerge victorious against the top seeds who so memorably won the World Doubles Championship in Australia last August. Having received a bye into the second round, Kempsell and Moran saw off Tino Mackay Palacios and Chris Murphy 2-0 (11-2, 11-2). They then successfully hurdled the challenge of Chris Leiper and Jamie Henderson, emerging as 2-0 (11-9, 11-3) winners to reach the final. There they produced a superb display to upset the odds and secure the national title. Having won 2-0 (11-6, 12-10), the duo completed the tournament without dropping a game. Moran said: “We came into the event off the back of a win over England duo Declan James and Tom Richards in Manchester last week which gave us a lot of confidence. He continued: “We set out with very specific tactics because we know there game so well. “We had to be meticulous in our tactics and back ourselves in the big points which we did. Kempsell believes the underdogs tag played a part in the win. He said: “I think the way we played showed that we didn’t have any pressure on us. We went out there relaxed to do our best. “We worked well together, we have been in positions before where we have had a chance to finish things off but haven’t. Today we were able to do that. Ali Thomson and Katriona Allen emerged as winners in the women’s event following a professional 2-0 (11-4, 11-5) win over Lucy Murchie and Maddie Orr in the final. Allen was delighted to come away with the victory. She said: “It was really good; it’s a new partnership so we’re still learning. Thomson and Kempsell also won the mixed doubles which was played in a round-robin format. 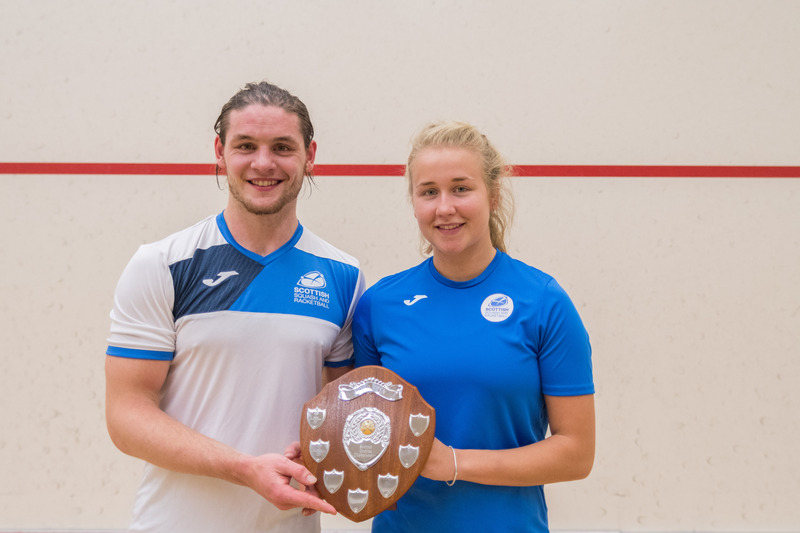 They defeated Katriona Allen and Jamie Henderson 2-0 (11-6, 11-3), and Maddie Orr and James Dougan by the same scoreline (11-4, 11-4). 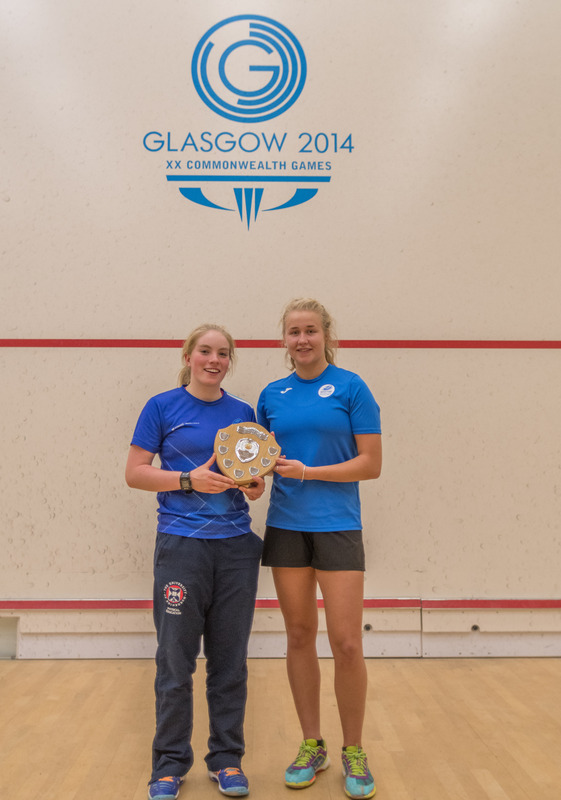 In the final match, the pair completed a whitewash with a 2-0 (11-8, 11-3) victory over Lucy Murchie and Jack Orr. Thomson said: “We’re obviously very pleased. I had played with Doug in Manchester before and we have trained together so we knew each other’s game.